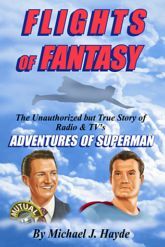 This book includes Superman episode logs for radio and television, complete storylines for two unproduced TV episodes, and dozens of "deleted scenes" taken right from the scripts! "Hayde probes the backgrounds of the real-life individuals behind-the-scenes and before the microphones and cameras that intensified that aura. In breezy, comprehensive style, he focuses on the radio and TV manifestations while interweaving timely inferences from the newspaper strip, comics, books, film and other formats plus a prosperous merchandising trade. " - Jim Cox, author of Radio Crime Fighters. "With so many books about Superman out there, it's pleasing to know that one book has everything you'd want to know under one cover. Trivia, background production and numerous behind-the-scenes stories make this a must-have for everyone's shelf. An enjoyable read." - Martin Grams, Jr.